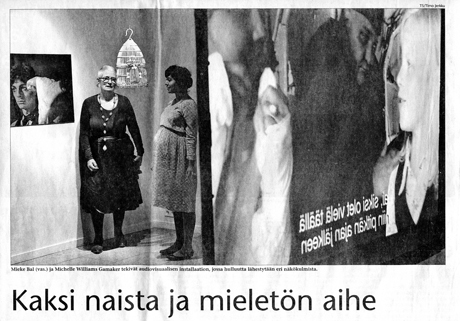 Thursday October 30th was the big day: the exhibition Landscapes of Madness opened at the Museum Aboa Vetus Ars Nova in Turku. The 16 video installation pieces, in a total of 21 screens, were disposed according to a spatial concept over 7 galleries. The description of the works is in Landscapes of Madness. 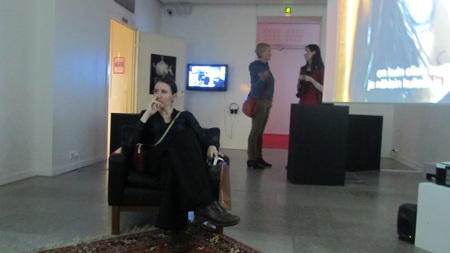 The build-up of the exhibition was masterfully managed by the museum coordinator, Pamela Andersson, and the curator Mia Hannula was clearly aware of the root “care”in the word curating. Together, they were a great team. Michelle and I were very moved by the commitment of everyone in the museum and the beauty of the result. On the first photo, you see the reconstruction of the historical inmate’s cell in the psychiatric hospital on the island of Seili. On the chest of drawers we had placed the video shot in the actual cell, to create a mise-en-abyme effect.On the second photo on the armachair, Marja Skaffari, the actress playing Sissi, watches “The Space In-Between. In the background, Mervi Appel, who plays Morgue, and Mia Hannula, the curator, who plays Aurora. I also add a photo from the very extensive press we received. 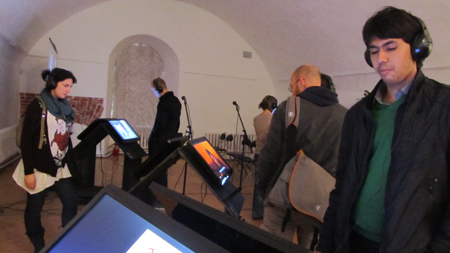 Yesterday, October 10th, the exhibition Towards the Other has opened and the interest was overwhelming. In addition to the Consul General of the Netherlands and a lot of television and press, the crowd was a lovely mix of colleagues and young people, probably lots of students. In a first room, black lecterns looking like small houses with 10 screens on the roofs display the films I have called “Migratory Stories”; in the middle room, a work by the collective Chto Delat, and in the third room a large “living room” installation of Nothing is Missing. 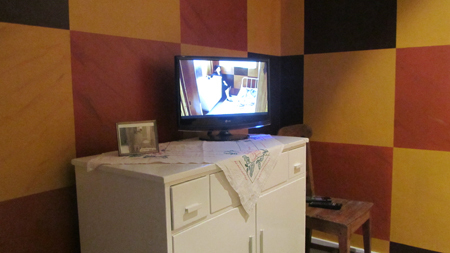 The first room looks like a public space, from where visitors can peep into the houses to see the lives of the people; the last room, in contrast, has the domestic ambience characteristic of this installation.